Today’s second injection of undiluted Review straight to the base of your spine. This time, it’s some of the big boys: Superman, Batman, African Batman and …er… Static Shock. And Grant Morrison, put on the first issue of Action Comics after the rebooting of the entire DC universe, gets to overwrite the entire history and metaphor of Superman. The first issue from a writer like Morrison, is pretty much a guaranteed Statement of Intent. Last time he touched the Man of Tomorrow, Morrison wrote him as an omnipotent Sci-Fi Jesus. He came down from the skies and cared for all of humanity, and sacrificed himself to save us. This isn’t quite that Superman. Apart from being younger and less all-powerful (and wearing jeans! Can you imagine Jesus wearing jeans? ), the central metaphor is different. It’s laid out pretty clearly on the first page: “Rats. Rats with money. And rats with guns. I’m your worst nightmare”. This is Superman as the champion of the oppressed, delivering social justice. 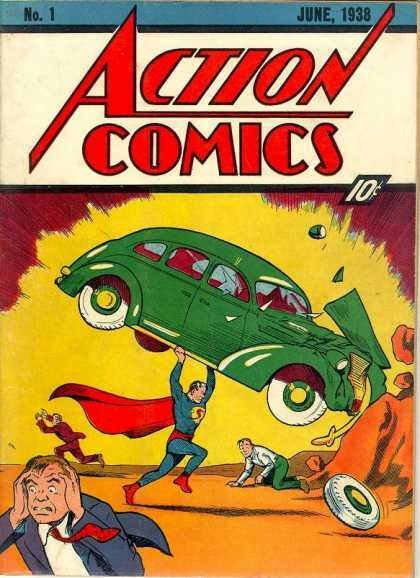 It’s something Morrison has often discussed being at the heart of the character from his very first appearance: smashing a car on that iconic cover from 1938, the last time Action Comics had a #1. And so Superman’s targets are corrupt businessmen who take advantage of cheap labour, men who hit their wives, and xenophobes. Being honest, the metaphor and the Brand New Direction are more interesting than the actual plot. It’s thrilling enough, and well-told, but there’s nothing about the story that leaves me craving the next issue. It’s not even that heavy on Morrison’s trademark Big Ideas. What will bring me back is faith in Morrison, and Morale’s gorgeously cartoony art (why couldn’t all the new books look like this? This is what Accessible Comics in the 21st Century should look like). Most of all, I want to see where the book’s going to go with all the underlying stuff, what it has to say about social justice and inequality. Batwing is the first solo title I’ve reviewed, and the difference it makes to the pacing of the comic is immediately felt. Rather than having to cram in multiple introductions (or, in the case of Justice League, only introduce a few characters and leave the reader feeling short-changed) it has one central figure to build a story around, and while a supporting cast and recurring villains are also introduced, their characterisation isn’t so essential, so can be dealt with at a more leisurely pace. Batwing doesn’t feel nearly as rushed as other titles have, and as such feels more like a story in its own right, rather than a preamble to the real meat of a title. I haven’t been reading the “Batman Incorporated” arc (I can already feel Alex tutting at me across the Internet) so this is my first encounter with Batwing. I must admit, the concept of “Batman of Africa” struck me as both a little hokey, and lodged in the Silver Age (people do realise Africa isn’t one big country, right? Tell me I’m not in the minority on this…) but Judd Winick makes it work by highlighting the similarities between Gotham and Batwing’s Tinasha (such as a corrupt police force and a brazen criminal culture prone to theatrics) without sacrificing the cultural identity of the Congolese setting, or falling into stereotypes. The universe relaunch works in the title’s favour – with superheroes reinvented as a more recent phenomena, the huge disparity in global distribution is easier to accept, and Winick and Ben Oliver seem to be addressing this ever further by building a superheroic mythology for Africa in the DCU. More than anything, the art sells me on this book. Ben Oliver’s pencils and inks are gorgeous; astonishingly detailed, with realistic expressions and great costuming without sacrificing dynamic layouts or a sense of weight and movement in the action sequences. It’s a truly beautiful comic, aided by Brian Reber’s painterly colouring, which gives the daytime sequences a kind of heat haze while adding a moonlight glow to the action at night. Time will tell whether Batwing will generate enough sales to keep it going far beyond its first arc, but if the standard continues to be this high, it deserves a long and healthy life. It doesn’t use the relaunch to do anything new, and the story would have fitted just as neatly in the status quo six months ago. Everything’s the same, including Tony S. Daniel, who’s been a regular artist and/or writer on Batman for nearly five years now. Except, okay, the police don’t trust Batman, which, as someone commented on the JL review, feels a little like a character being brought more closely in line with his film counterpart. Nevertheless: I’m pretty hooked on the central whodunnit, which is at it should be in something called Detective Comics, and that last page is seriously ballsy. Daniels’ art is looking better than I’ve ever seen it, and he makes a surprisingly good writer. He manages to fulfill both ends of the job well: putting Batman in positions where he looks cool, and then drawing him to look really damn cool. That’s all you need to do, really, and if I was picking this up as my first ever Batman book, as DC are surely hoping someone will, I’d be back next month. As I come to write this review I find myself worried that I’m going to seem hypocritical. I’ve complained that other comics I’ve read in The New 52 have been long drawn out blocks of text that, in real life, would sound unrealistic if spoken aloud in conversation. Static Shock goes in the opposite direction however and keeps the chatter appropriate… which you would think would be a good thing… yet I’m still not happy. Mostly because the large amounts of text are due to DC, quite rightfully, assuming that not everyone reading is going to know who their characters are and so wanting to fully introduce them. Static Shock does JUST about introduce it’s characters but of the full 18, seemingly important, people with speaking parts only a handful are named or given any explanation as to who they are. Now, I’m not stupid. Yes I can work out that some are his family, some are his enemies, one guy seems to maybe be his boss. But the point is, did Static get the memo that this is a relaunch? As comics go it’s exactly what your average non-comic reader would expect. There’re brightly coloured costumes, crazy powers, fights with explosions and over-the-top villains, but is it what we should expect from a first issue? I came away feeling like I’d missed some plot already. I actually genuinely think this story carries over from a previous Static title. I’m probably wrong but I’ve been left feeling like I’ve switched the TV over to what seems to be an okay film that’s halfway through. It looks good granted, but if I’ve not seen the beginning I’m not interested.